The calendar app in Android is sleek-looking (Material Design) and offers a bunch of useful features. 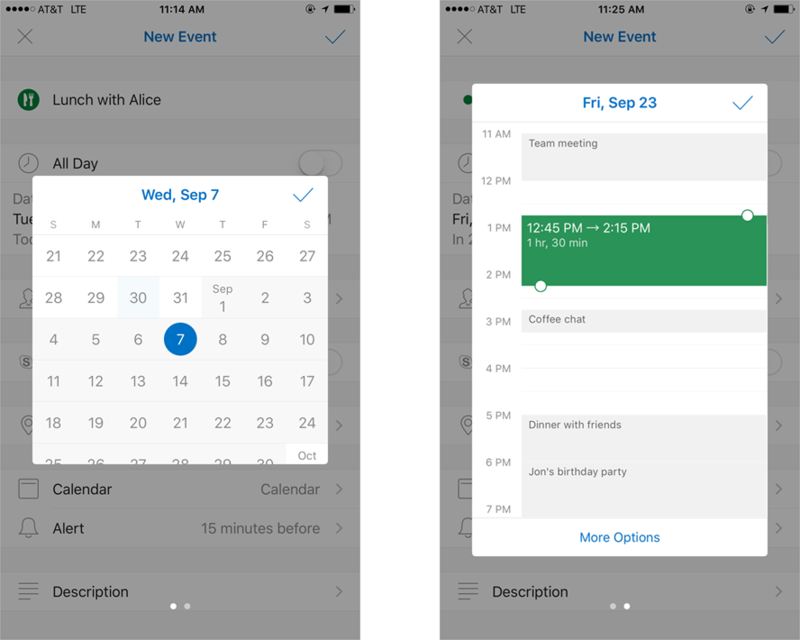 Microsoft wants to make Outlook, its very own calendar app, the best mobile calendar, so they have to introduce new features to get ahead of Google's or Apple's calendar on mobile devices. To do that, Microsoft has acquired the company behind the famous calendar app "Sunrise", stopped the its development and brought its features over to "Outlook", Microsoft's combined email and calendar app. This course continues with the latest update: There are many new features, some of them only for iOS users at the moment, Android will follow shortly. First of all, there is a new feature called "Interesting calendars" that allows you to subscribe to publicly available calendars e.g. from your local sports team. This way, you'll have all their match days right in your calendar. The second new feature brings icons that are added to an event while you write its name: Type in "coffee" or "lunch" and a small cup or knive and fork will appear next to the event. At the moment, these are the only two we found out about, even simple things like "travel" or "flight" don't trigger icons at the moment. Furthermore, Google's calendar app does have this feature for some time and it looks quite good in their calendar app. You are now able to choose a place for your event which will be automatically shown on the map. 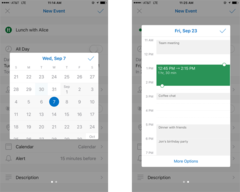 This feature has also been available in Google's calendar app for some time. Microsoft has transferred the way you choose a date and time for your event from "Sunrise". This way of choosing has been available in the desktop version of "Outlook" for some time. Recurring meetings can now be edited within the app. You can't, however, create recurring events on your mobile phone, this feature will be included in a future update. Using the calendar of Office 365, you will be able to include "Skype for Business" calls. The login data will be automatically shared with participants and you just have to tap once to start the meeting.